The Axis host-to-LAN print servers provide a flexible and cost effective way to print to your LAN printers or digital copiers from your AS/400 or Mainframe system. They enable high-speed printing over Ethernet, Fast Ethernet and Token Ring networks without the need for application changes, host-based conversion software or intermediate servers. In addition to support for environments such as NetWare, UNIX and Windows, the Axis host-to-LAN print servers deliver world-class support for IBM host system printing over TCP/IP and SNA. The flexibility to choose between multiple print methods including TN3270E and TN5250E, as well as SCS and IPDS data streams, makes them the ideal solution for the enterprise network. With simultaneous support for SNA and TCP/IP, Axis host-to-LAN print servers offer an excellent transition to TCP/IP-based networking. The same print server will work in both environments without compromising control and visibility of the network printer. True bi-directional transport protocols assure a tight and controlled flow of status and data in a direct path between the IBM host system and the printer. Users get the same functionality as from a traditional IBM printer connected over coax or twinax including features such as error recovery, exception notification, job control and end-of-job notification. The concept of distributed data conversion deliver great scalability and helps freeing host system resources for more critical tasks improving overall system throughput. Any matrix, laser and even some ink-jet printers may be used as well as digital copiers. Axis host-to-LAN print servers come with built in support for digital copiers, eliminating the need to modify IBM or UNIX host applications or install additional drivers. With support for finishing options such as stapling, hole punching and copying, any user on the network can enjoy the flexibility and power of a digital copier. Axis host-to-LAN print servers support OS/400, OS/390, Windows NT, Windows for Workgroups, Windows 95/98/2000, OS/2, NetWare, UNIX and more. In addition, they are easy to set up and will auto-configure to the AS/400. Standalone 1 port 10/100baseT/ Ethernet print server with advanced TCP/IP and SNA support for non-IPDS and IPDS IBM host system printing. Support for digital copier finishing options. Please visit www.axis.com for a list of supported copiers. Standalone 1 port 10/100baseT Ethernet print server with advanced TCP/IP and SNA support for non-IPDS and IPDS IBM host system printing. Standalone 1 port 10/100baseT Ethernet print server with advanced TCP/IP and SNA support for non-IPDS IBM host system printing. Standalone 1 port 10/100baseT Ethernet print server with advanced TCP/IP support for non-IPDS IBM host system printing. Standalone 3 port STP/UTP Token Ring print server with advanced TCP/IP and SNA support for non-IPDS and IPDS IBM host system printing and digital copiers. control unit and subsequent coax printers when running SNA. The print server emulates an IBM 5494 control unit and subsequent twinax printers when running SNA. - - NetWare: IPX, SAP, RIP, SPX, NCP (extended with NDS), LIP and NDPS. - - TCP/IP- ASCII environments: LPD, FTP, Telnet, Reverse Telnet, PROS, BOOTP, ARP, RARP, DHCP, ICMP, IP, TCP, UDP, HTTP and TFTP. - - TCP/IP in Mainframe environment: TN3270E, raw TCP/IP, LPR/LPD, PPR/PPD, ASCII, 3270DS, SCS and IPDS data streams. - - SNA in Mainframe environment: SNA LU 1 and SNA LU 3 (node type 2.0). IBM 3174 control unit emulation. ASCII, 3270DS, SCS and IPDS data streams. - - TCP/IP in AS/400 environment: TN5250E, raw TCP/IP, LPR/LPD, PPR/PPD, ASCII, SCS and IPDS datastreams. - - SNA in AS/400 environment: SNA LU 6.2 (node type 2.1). IBM 5494 control unit emulation. ASCII, SCS and IPDS data streams. - - LAN Manager/LAN Server: NetBIOS/NetBEUI or TCP/IP. - - Windows: NetBIOS/NetBEUI or TCP/IP. - - Print server resident parameters set using a Web browser, AXIS NetPilot, FTP, HTTP or via a text file sent from the IBM host. - - AS/400 environment: 4332, 4028, 3812, 3816, 4214-2, 5224, 5225, 5256, 4230, 5x27-2 KS, 5x27-3 KSSM, 5x27-3 and 5x27-5. - - SNMP-MIB II compliant private enterprise MIB included. - - Print server status and management via NWAdmin/PCONSOLE and ThinWizard. - - UNIX: Root password, user access list and printer access. - - NetWare: Encrypted passwords. - - Supports NWay, which provides auto-detection of the network speed. Use of IEEE802.2, IEEE802.3, SNAP and Ethernet II frame types simultaneously. - - AXIS 5470e: RJ-45 connector (Category 5 unshielded twisted pair cable) for 10/100baseT Ethernet. - - AXIS 670e: STP/UTP Token Ring. version, each logical printer port can be configured to activate a number of finishing options in the digital copier. Please visit www.axis.com for a list of supported copiers. - - Two IEEE 1284 compliant high-speed parallel-ports, 25-pin DSUB. - - One IEEE 1284 compliant high-speed parallel-port. - - 1 serial port, RS-232C, 9-pin DSUB XON/XOFF or RTS/CTS. Data rates up to 115,200 baud. 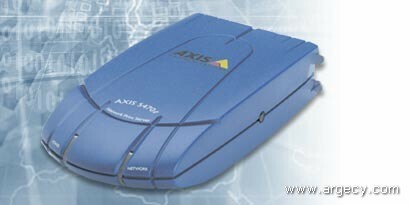 - - AXIS 670e - 2MB RAM memory. - - 2 LED Indicators: Power and Network. Push-button for information printouts. - - Maximum 5.1 W. Power provided by external supply. - - AXIS 5470e, 670e - Type PS-B 12V 500 mA. - - EMC CE: EN 55022/1987, EN50082-1/1992, FCC Class A. - - Safety: EN 60950, approved power supplies for all countries.